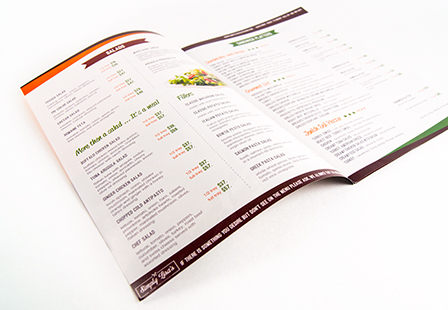 Custom brochures and printed flyers offer a variety of benefits including design flexibility, affordable, and easy to distribute. Our 80LB gloss book brochure and printed flyers can help promote a business, event, service or product to potential clients. You can efficiently distribute them while attending a business conference or trade show. They can also be placed on a stores countertop for passersby to grab. Business brochures and event flyers continue to be a powerful marketing tool for any size business. Other creating ways you can use them include menus, recipes, resumes, maps and more. Choose from a variety of sizes and folding options including the classic Tri Fold, 4-Panel fold, Z Fold, Half Fold, to meet your marketing needs. Printed single or double-sided.